Wisdom is required when we have to make life-changing decisions or choices that could affect and/or impact others. Faith is needed in order to believe things will improve. 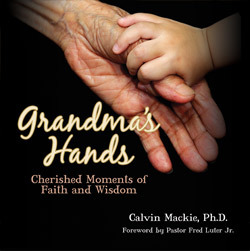 In his book entitled, Grandma’s Hands, Cherished Moments of Faith and Wisdom, Dr. Calvin Mackie uses spiritual and practical knowledge along with words heard from our Grandma’s, to guide us through life’s journey. Dr. Calvin Mackie has received awards that include the 2003 Presidential Award for excellence in Science, Mathematics and Engineering mentoring in a White House Ceremony. 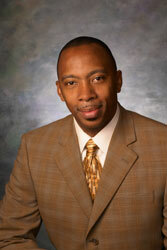 He’s also an award winning mentor that motivates various audiences throughout the world with powerful words. In this table top book, women (Grandma’s) from around the world are captured in rich, colorful captivating photos, with wise sayings and passages. King Solomon was a man that constantly relied upon prayer to guide and direct him through his life; most of us have seen King Solomon’s petitions documented in scriptures. If these principles are fit for a King to make grounded decisions, they are fit for us. With a variety of culture and ethnicities, Grandma’s Hands, Cherished Moments of Faith and Wisdom, enlightens readers with thought-provoking sayings such as “This too Shall Pass”. How often have we heard this? How often do we need to know and believe trouble will pass? “Everyone has storms that come into their lives. No one is immune to bad days, or months, or sometimes even years. The best thing we can remember about trouble is that the trouble didn’t come to stay.” This excerpt is one of hundreds, in Dr. Mackie’s book, designed to soothe the soul while adding peace and serenity, followed by the confirmation of scripture. As pointed out in his book, the rebuilding of New Orleans, as pointed out by Dr. Mackie, is a prime example of ‘This Too Shall Pass’. Be it issues related to relationships, aspirations, employment — from time to time everyone needs spiritually nourishing food to refer to. In his book, Grandma says, “You can do bad all by yourself;” scripture says, “Do not be mislead: Bad company corrupts good character.” 1 Corinthians 15:33. Dr. Mackie reiterates the power in these words by examples of those who wound up on the wrong side due to association. Mentioned in this review are only a few quotes compared to the many lessons, in this book. Its’ inspiring to read and prompts self-reflection. Grandma’s Hands, Cherished Moments of Faith and Wisdom, is a valuable book that compliments spiritual and practical principles. Not only Old saying are very helpful for young generation to learn various things about their life but also memories cards are helpful in cherishing previous time. Young generation wants to know about their past and their is no better way to do this by keeping them preserve with memorial cards and hand made cards.